The holidays are fast approaching and soon you’ll be starting to think about what gifts to get everyone, including that one Animal Crossing obsessed friend or family member. We’re here to help with our Animal Crossing Etsy holiday gift guide! While there’s plenty of Animal Crossing amiibo and games out there you could pick up as a gift, that’s not exactly unique. Besides, your recipient might even already own every one in existence. If you’re looking for something a bit more special and unique, Etsy is a great place to look. So we’ve picked out ten of our favorite Animal Crossing items on Etsy covering a wide range of prices. Don’t worry, we won’t blame you at all if some envy strikes you into getting something for yourself on this list too! Love the idea of the item plush but a little more affordable with character? Look no further than these handmade Animal Crossing Character & Item Clay Charms! You can get a fossil or leaf like the item plush, or any character from Animal Crossing: New Leaf. They’re tiny and perfect for a necklace, charm bracelet, or anything else. If you really like the look of these charms, this seller also offers a 14-set charm bracelet option for $56. It’s worth noting too that they take custom requests for basically any character, villager, or item in Animal Crossing. Get your own charm at Etsy here. You don’t always have to spend big to get something nice — this Animal Crossing Character Lanyard designed after Pocket Camp is just $9 and makes a great gift for that person who just wants to be surrounded by Animal Crossing characters all the time. Perfect for carrying car keys or a ticket pass. Get your own lanyard at Etsy here. Does your friend just love Animal Crossing’s soothing soundtracks? 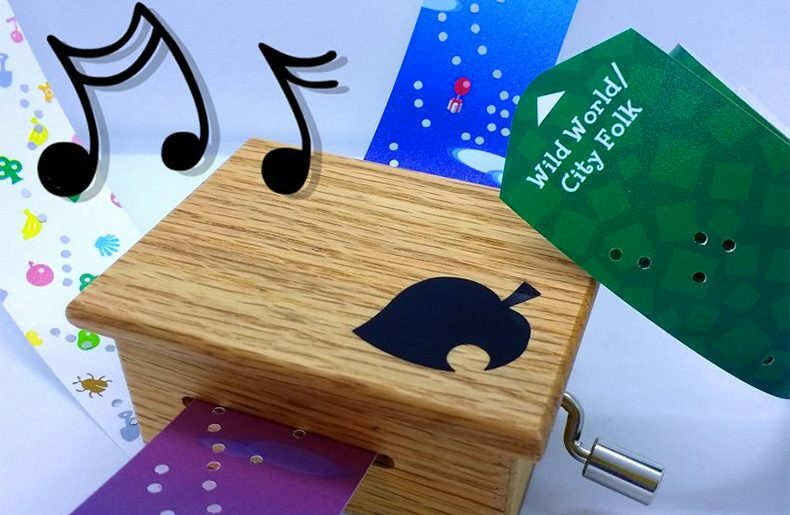 Get them a handcrafted Animal Crossing Music Box Set! With this fully functional music box, you can play an Animal Crossing song using special strips with punched holes. Just turn the handle to feed the strip into the music box and play the song! Each box comes with an included strip of your choice — the default is the New Leaf theme, but other specific songs or different Animal Crossing games are available too! There’s also some beautiful painted color options for an extra charge. Get your own music box at Etsy here. Just can’t wait for Animal Crossing on Nintendo Switch to release next year in 2019? Help pass the time with this affordable Animal Crossing Nintendo Switch Dock Cover! It’s an adorable soft cover for the front of your Nintendo Switch dock decorating the boring black plastic with a lovely Animal Crossing pattern design, featuring item icons from the series. Get your dock cover at Etsy here. You can bring both Animal Crossing and organization to someone’s life with this cute little Animal Crossing Coin Purse / Pouch! It packs a lot of punch in both a tiny form and tiny price. Somewhat similar to the Nintendo Switch Dock Cover, it’s packed full of Animal Crossing icons for everyday items. Get your coin pouch at Etsy here. Know somebody that is just obsessed with one particular villager or character in Animal Crossing? There’s not much better than getting their favorite character custom made into a wool doll with this Animal Crossing Custom Character Wool Doll! They’re definitely on the pricey end of things ranging from $50-$100 depending on complexity, but it’s hard to beat a custom made doll for any villager of your choosing. Each doll is about 7-8 inches tall — check out some examples above. Place a custom order at Etsy here. Bells are everywhere in Animal Crossing and you can get your own bag in real life! We love the look of this super soft Animal Crossing Bell Bag complete with a yellow or orange farbic lining inside. Fill it up with anything you want — even better if it makes some noise! Get your own bell bag at Etsy here. Getting letter-mail in your Animal Crossing mail box is always great when it comes on some cute stationery! What’s even better are these real world versions of them for either collecting or writing letters to friends with the Animal Crossing Stationery Notecards Set! The seller of these stationery cards have a wide variety of different options depending on what theme of notecards you’d like, if you want some matching Animal Crossing envelopes with them, or if you get them in a gift box set. Check out all the options on Etsy here. OK — we admit it, this is pretty extravagant, but wow it’s special! For $180, you can get a real working Animal Crossing Nintendo Switch Pro Controller completely custom painted to be themed and customized to Animal Crossing. What better way is there to pass the time until Animal Crossing for Nintendo Switch releases in 2019? Specifically, this custom theme matches the ‘poptart’ design of the Animal Crossing 3DS XL released back in 2013. Order your Animal Crossing controller at Etsy here. These adorable Animal Crossing Item Plushies are some of the best value impact for the price gifts you can get! They make a selection of four different soft fabric plush for the furniture leaf, pitfall, fossil, and the 100 Bells coin. Prices range from $12-$21 depending on the version, and a four-set at $70 if you really like them. Get yours at Etsy here. This gift guide includes links as part of the Etsy Affiliate Program which provide a small commission to us when you purchase an item. All photos are owned by the appropriate sellers on Etsy.